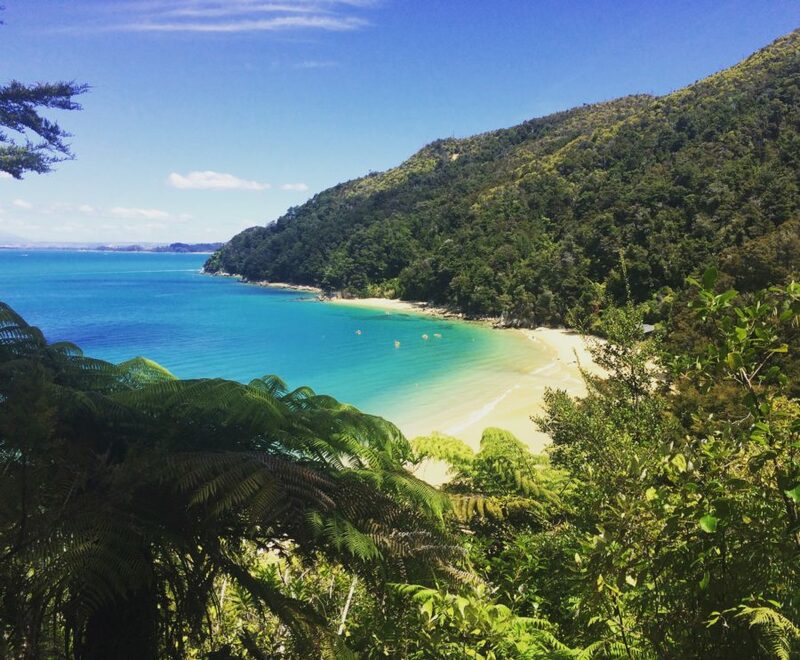 Why Golden Bay in New Zealand is so great? If you are searching for beautiful beaches with gold sand, turquoise water and ample outdoor activities then Golden Bay is the ideal place for you. New Zealand is famous for it’s maritime refreshing climate, relatively high rainfall and a couple of hours of sunshine on a lucky day. But I have good news, there is a place at the top of the South Island where you can absorb vitamin D most of the time. This vast Eden will spoil every nature lover with it’s incredible scenic views, never-ending walkways and relaxed atmosphere. Nevertheless check the essential packing list for New Zealand before you plan your visit! The tranquil region is comprised of very small rural towns and farms where you can find a couple of old-fashioned as well as less old-fashioned restaurants and pubs. The majority of the population is made up by families with young children, the elderly generation and plenty of German backpackers having a carefree lifestyle. Golden Bay offers everything to escape reality, furthermore if you want to hideaway from civilization and maybe even start your own little business, go there. But as every heaven on Earth even this place has something unpleasant and it’s thirsty mosquitoes. 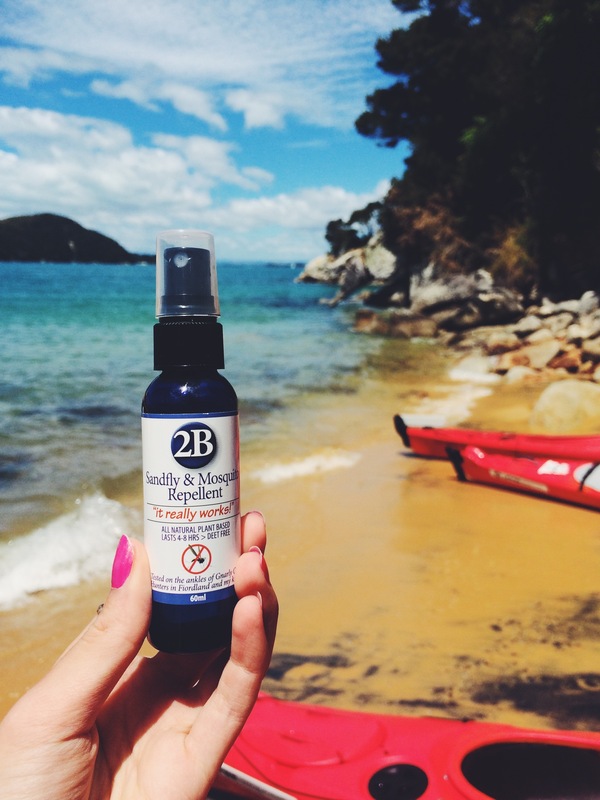 Nevertheless there is a great product made by locals that I discovered there: 2B Natural Insect Repellent. It’s always great to support a local business especially knowing that all the oils used to manufacture that spray are organic. The smell resembles a spa salon and the spray’s effectiveness is surprisingly good: haven’t been touched by any cheeky sandflies afterwards. The other incredible aspect is 2B is waterproof and long lasting. You can find it online or in many other shops across spacious New Zealand. Trust me nothing will protect your precious skin better than this spray! 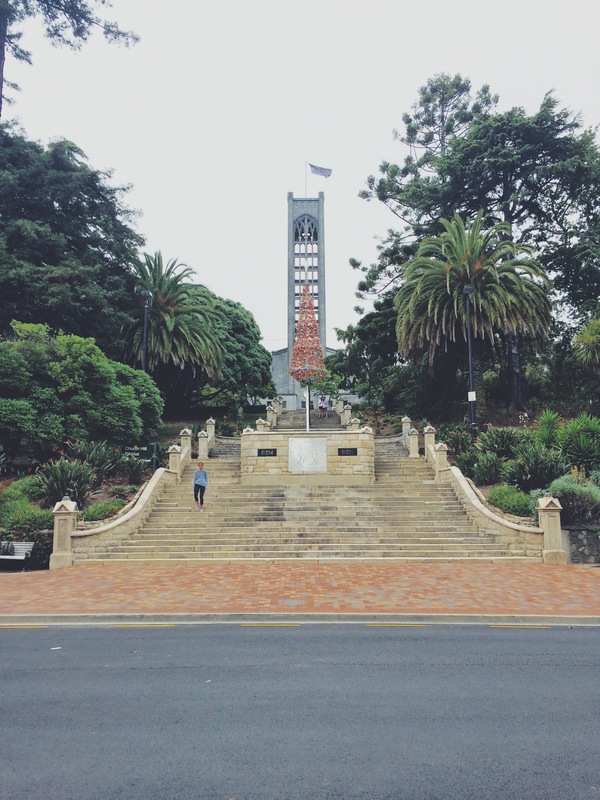 Nelson is a lovely town on the top of New Zealand’s South Island which should be the first stop on the way exploring the beauty of New Zealand. The best and inexpensive way to reach the jewel is to fly. Compare the prices on good old sky scanner. The sun shines almost all the time in Nelson which emphasizes the great outdoor experiences like hiking, kayaking, biking and causing. These aspects attract plenty of tourists and backpackers that’s why it’s very easy to find a place to stay. Nevertheless I would suggest to book a room or bed 1-2 weeks in advance during the high season, which starts in December and ends in March. I stayed in a tidy, cozy and exceptional hostel equipped with facilities such as a swimming pool, jacuzzi and sauna: Paradiso Backpacker Hostel. It’s located just 15 minutes away from Nelson’s center and offers a good breakfast and on some days even dinner. The prices are acceptable, most rooms are occupied by 4 people and have their own bathrooms. New Zealand is all about breathtaking views and mesmerizing landscapes, that’s why you need to start your day with the Centre of New Zealand Walk. I would suggest to start your 45 minutes walk from Atawhai Dr. towards the town’s center. Keep your finger on the trigger because you will be surprised by picturesque sights of Nelson and it’s harbour. 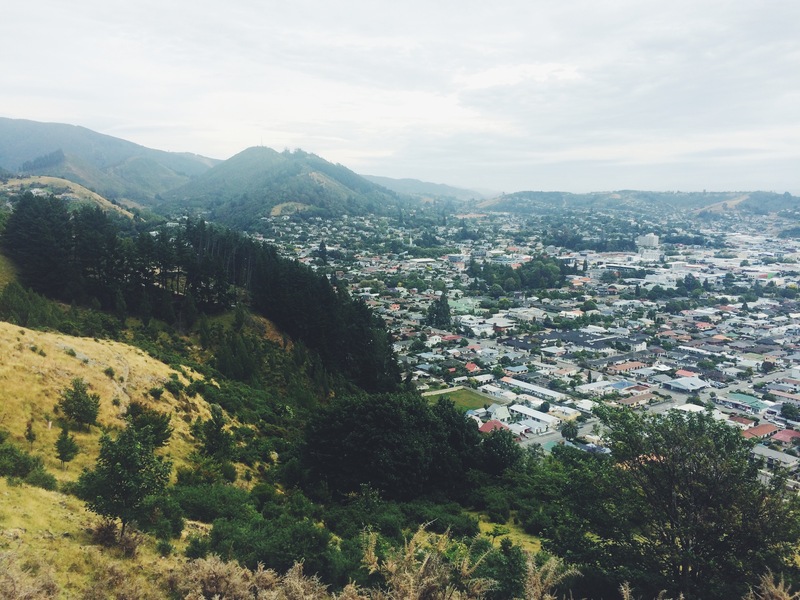 After some Instagram-worthy views head toward the cute city of Nelson. If you’ve been traveling a lot then nothing will surprise you, as anywhere else in a town next to the beach there are various possibilities to dine, shop in the boutiques and visiting museums. Nevertheless it’s fun to walk around and sometimes you can discover curious things like an exhibition of local artists in one of the parks for free. So it’s a nice spot for typical backpackers to stay there and find an easy-going job. Stoke is one of the suburbs of Nelson with a modest population of almost 18.000 people. It’s an ideal area to stop and discover some hidden jewels on your way to the next destination especially if you have an affinity for beer or food. You’ve probably heard that beer has played a significant role in the local culture of New Zealand, going back to the 1840s. And not only because Kiwis love to drink beer under the gentle sunbeams but being home to the perfect location and climate to cultivate the best and most unique hops in the world. 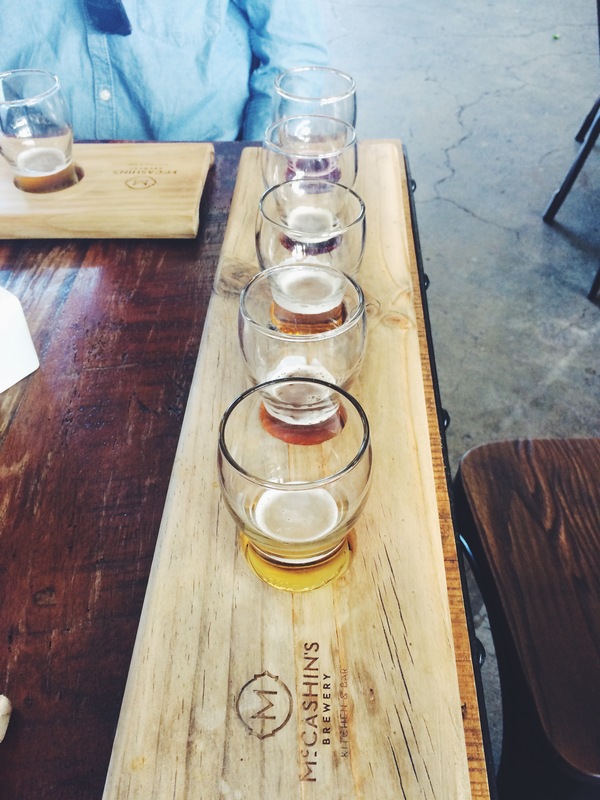 That’s why you will find numerous breweries in Nelson region but at McCashin’s you can have a tour through their big beer factory accomplished by tasting a wide range of unique beers. If a tasting dose was not enough for you then you can purchase more of this refreshing drink at Mc Cashin’s restaurant. If you didn’t have time for a proper breakfast or you are planing to have long ride then visit the hidden oasis of Crusoe´s Cafe & Bar. It’s a tranquil spacious restaurant with a funky decor and cozy, relaxing atmosphere. There are many great aspects about this place. One of them is that they please every food preference that exists on the planet. I’m not talking about vegetarian or lactose intolerance, because we got used to it already but also the special needs that makes everyone’s life more complicated like gluten free and vegan. Moreover the size of the meals will make your eyes grow. 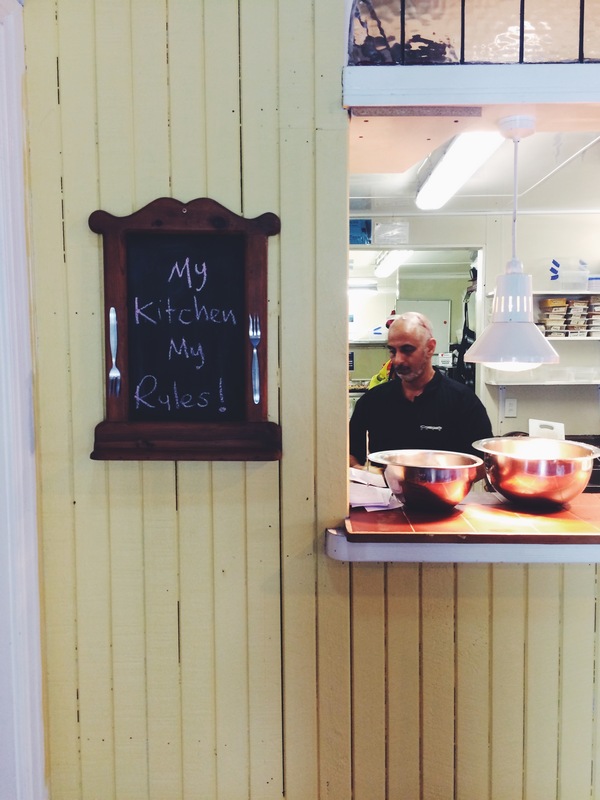 The place is beloved by the locals because of the homemade and locally sourced food. 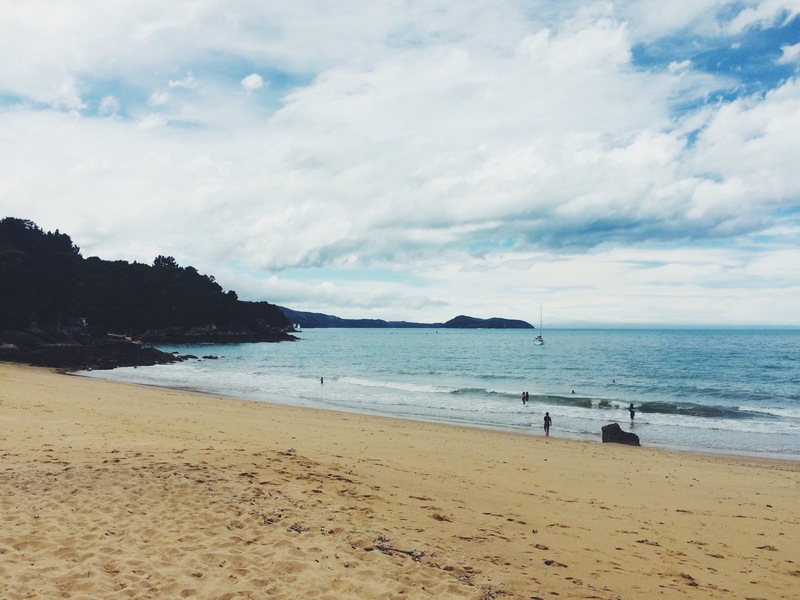 No doubt that Kaiteriteri is home to one of the most beautiful beaches of Golden Bay. It lays around 13 kilometers from Motueka and offers incredible golden sand and clear turquoise water. The magnitude of the main beach is vast but if you require something a bit more private then there are two attractive alternatives for you: on the left side from the main beach behind the bushes you will discover a path leading to a smaller beach, which carries the name Breaker Bay. It’s the epitome of a lovely paradise, surrounded by rocks covered with huge mussels. On the right side is Kaiteriteri’s little brother, equally beautiful but with less people. To have a better overview of the scenery you can wander to the top of the cliff above the beach. Don’t forget to take a drink and a partner with you to make that moment even more memorable. 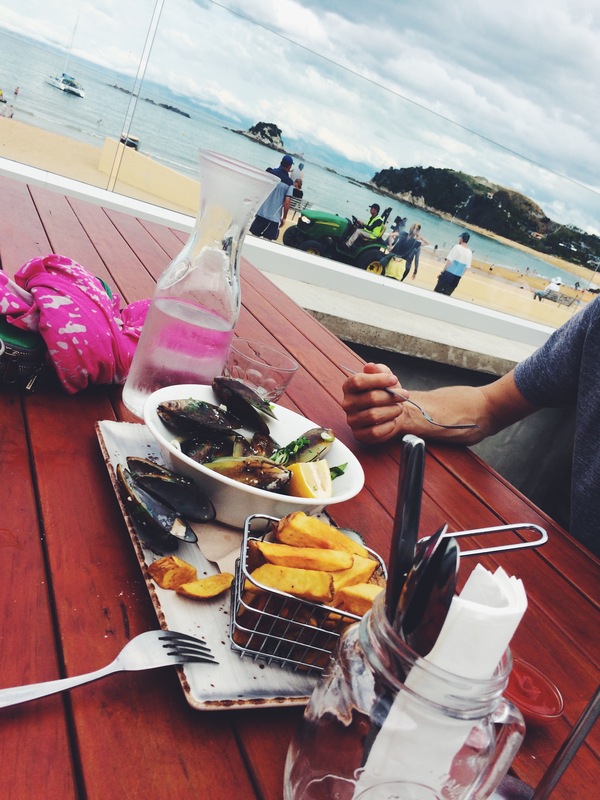 If you got hungry after all the exploring visit one of the restaurants and try their seafood. Just be sure that it won’t be fried because Kiwis have the tendency to batter up nearly everything. 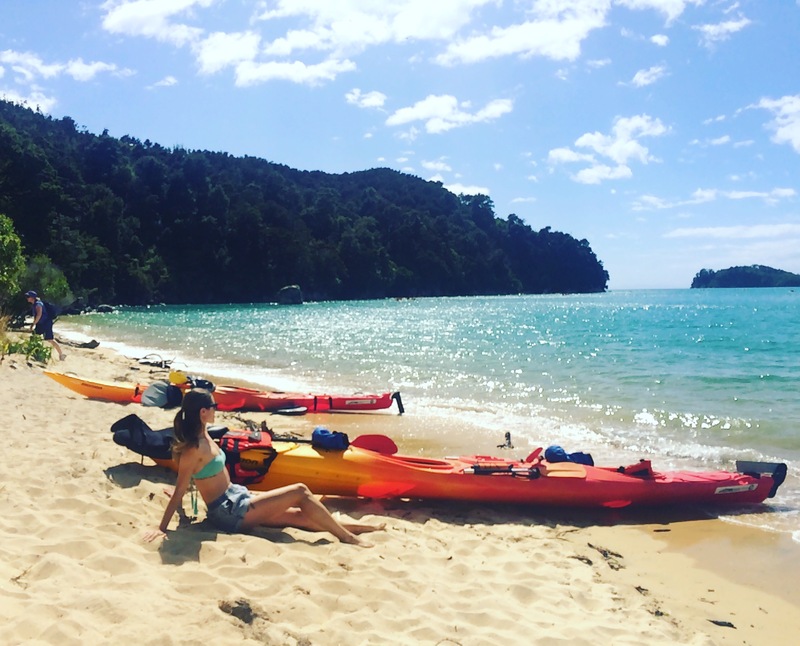 A must do in Golden Bay is a kayaking day tour along the mesmerizing Tasman Bay coastline. Do it with the great Kiwi owned Tasman Bay Sea Kayaking operators starting all their tours from Old Macdonald’s Farm Holiday Park in Marahau. Even if you’ve never kayaked before, don’t worry, they will train and take care of you so you will turn into a professional by the end. I booked a full day adventure for $125 with them which included 3 hours of great adventure on the water with the amazing guide Troy and a 3,5 hour walk through the Abel Tasman National Park from where I could take plenty quixotic pictures for my blog and memories of course. The difference to other kayak tours is that the groups are much smaller and instead of being surrounded by 6-10 double kayaks you will almost have a private tour of 2 or 3. It means you can hear all of Troy’s interesting stories about the environment and mythology of New Zealand and paddle freely in the sparkling waters at the same time. Golden Bay offers beautiful spots where nature shows it’s best. 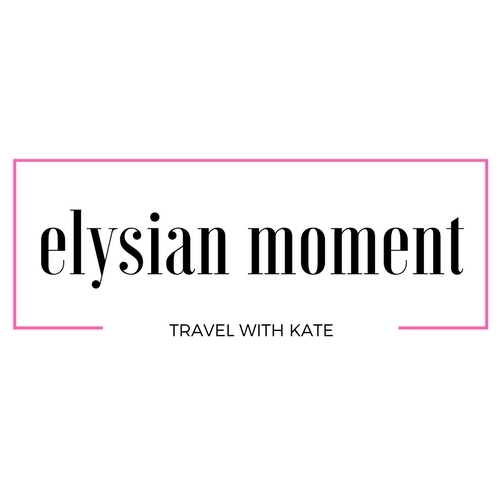 If you want to expand your trip check out A PERFECT NEW ZEALAND SOUTH ISLAND ITINERARY – A 2 WEEK ROAD TRIP. You can easily explore the surroundings without paying anything for it by hitch hiking and discovering walkways by feet. You will need at least 2 weeks time to complete the incredible adventure and collect unforgettable impressions. 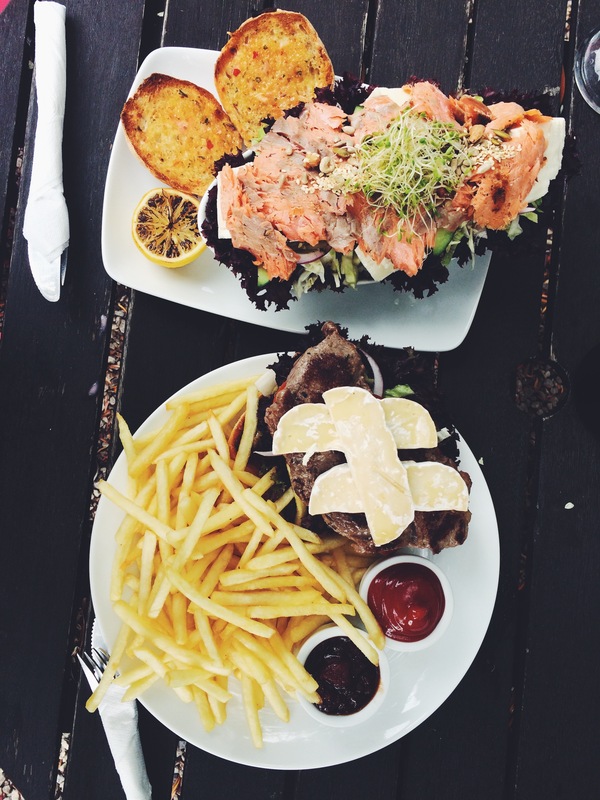 Go further, reach Takaka, ride horses on the beach coast and try savory seafood. New Zealand is unfortunately not a cheap country but don’t think about money, it’s all about enjoying the moments. Planing your trip to the North Island too? 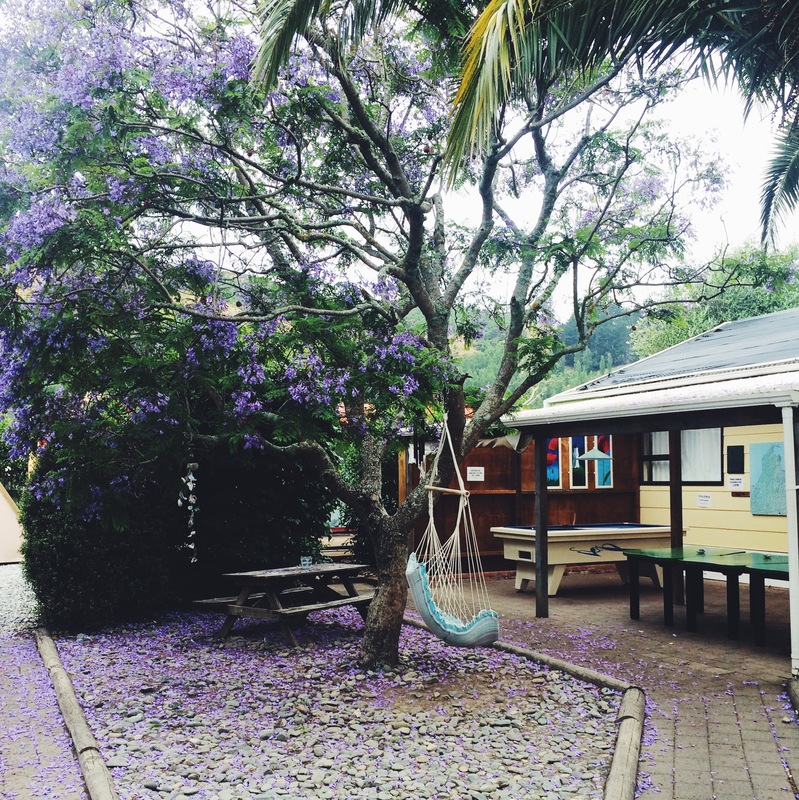 Here are the places that you can’t miss if you are in New Zealand! I have destination envy now. 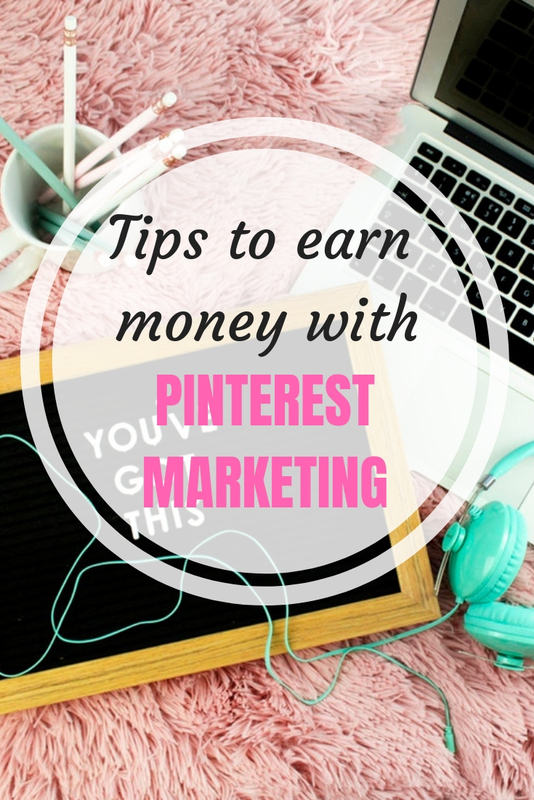 Great information and gorgeous pics. Your pictures are stunning. New Zealand is definitely a place I want to visit one day. I had a Kiwi guy stay with me for 6 month when we lived in California, he told great stories and my interest grew every day. 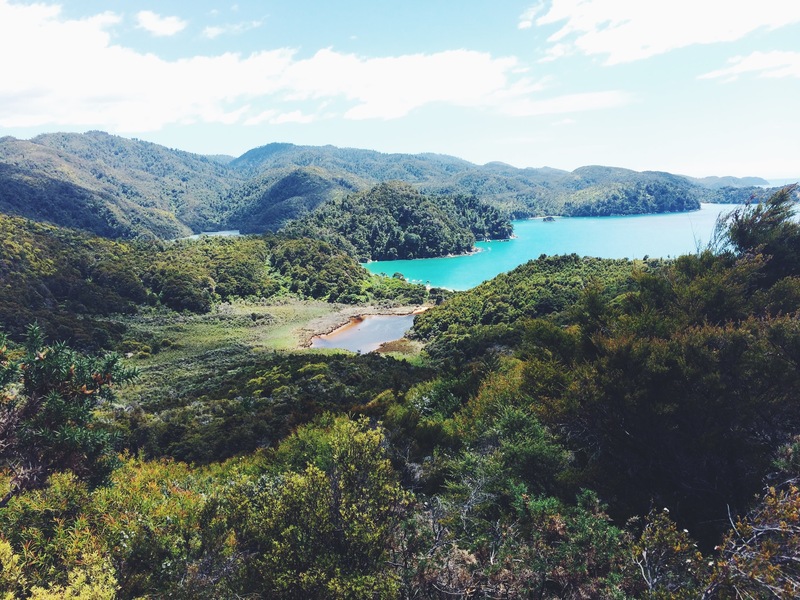 My favorite pic from you is the Lookout from the Abel Tasman National Park. Wow, makes me want to look now for flights. Thank you for sharing this. So many interesting and tasty recommendations! Obviously, my knowledge about New Zealand was very limited!